A unique patented interlocking rail and drawer system prevents the drawers in these carts from shifting off the rails. Each cart features a tubular metal frame, with four casters (two locking) and a metal top shelf (the 12- and 20-drawer double-wide carts have six casters, three locking). Choose your ideal number and configuration of stacking drawers, in smoked or multi-colored plastic. The inside bottom dimensions of the tapered standard drawer: 13-3/8"L × 9-3/8"W × 2-1/2"H. The inside bottom dimensions of the tapered deep drawer: 13-5/8"L × 9-3/4"W × 5"D.
Each drawer holds approximately 3 lbs and features a metal pull and molded stop that keeps it from sliding backward. Mobile Storage Cart, 10-Drawer — This cart includes 10 standard-size drawers. Available in Multi or Smoke. Mobile Storage Cart, 12-Drawer — This cart includes 12 standard-size drawers. Available in Multi. Mobile Storage Cart, 20-Drawer — This cart includes 20 standard-size drawers. Available in Multi. Mobile Storage Cart, 6-Drawer — This cart includes four standard-sized and two deep drawers. Available in Multi or Smoke. 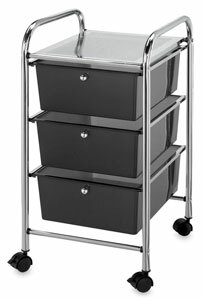 Mobile Storage Cart, 3-Drawer — This cart includes three deep-sized drawers. Available in Smoke.